Facebook took a step forward in its efforts to ease the process for developers seeking to integrate their applications with the social network, announcing the rollout “over the next few weeks” of a new app registration flow. The revised flow eliminates several steps from what had become an overly complicated process, and it includes interactive guides to help developers through the undertaking, as well as making it easier to add Facebook Login. 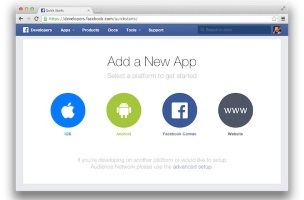 Our goal is to make building Facebook into your apps as simple and quick as possible. 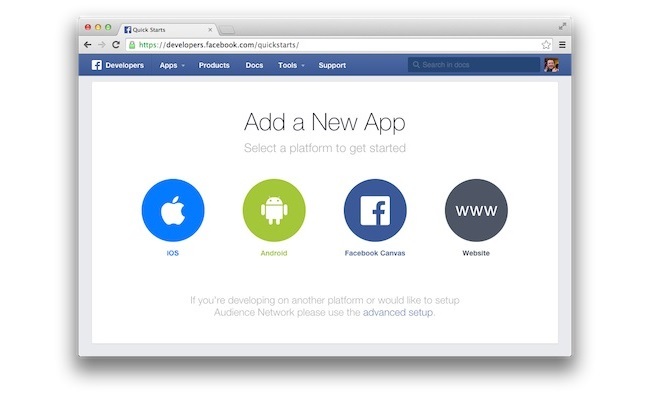 So today, we’re announcing a new experience for integrating apps with Facebook. We are starting to roll this new flow out today, and over the next few weeks, it will become the default experience when integrating a new app, or extending your Facebook integration to a new platform. In the original app-creation flow, you had to find and download our latest SDKs (software-development kits), create a Facebook App ID, enable the platform you were building for and then copy and paste certain information between our docs and your development environment — all while trying to read our documentation. We are always trying to improve the experience for developers, and having a quick start to integrating with Facebook is one example. In the new app registration flow, we’ve drastically simplified the experience, and we added interactive guides to lead you through the process of integrating an app with Facebook. Now, we will only display the steps relevant to your app. Additionally, SDK downloads are included inline, along with code you can copy and paste into your app. Once you’ve registered your app with Facebook, we’ve also made it easy to step into other relevant parts of our documentation. For example, after you’ve installed the Facebook SDK for iOS or Android, you can jump right in to adding Facebook Login to your app. At this time, we have setup guides for iOS, Android, websites and canvas. In the future, we plan to broaden these guides to include more platforms, as well as extend the steps to let you fully integrate each of our products such as Login, sharing or App Links. If you’re building for Windows Phone, page tabs or other platforms that are not supported by this new flow, you can still access the original app creation flow by using the advanced setup link at the start of the guides. 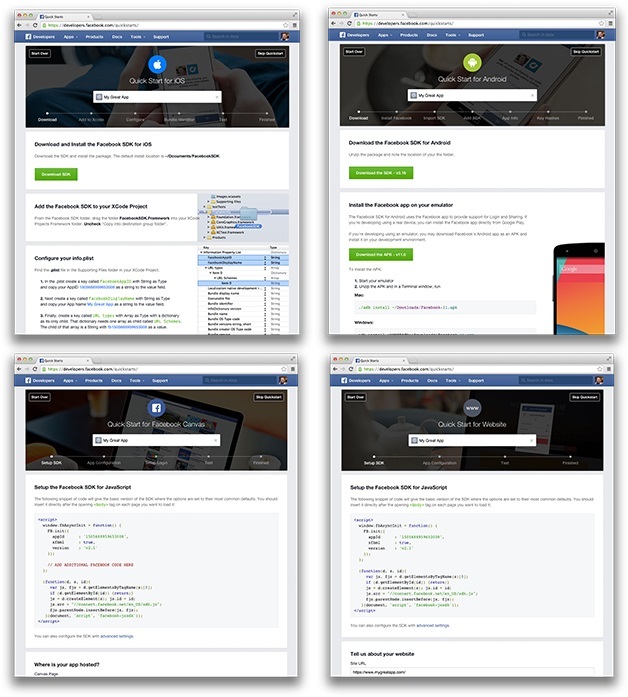 Developers: What are your initial thoughts on Facebook’s new app registration flow?